If you’re happy and you know it… read a book! For some reason, I’ve only ever seen this small board book for sale in National Trust gift shops. First spotted by a colleague of mine, we bagged it for our toy library because it’s a great little action book for babies and small children, no matter what their physical abilities. 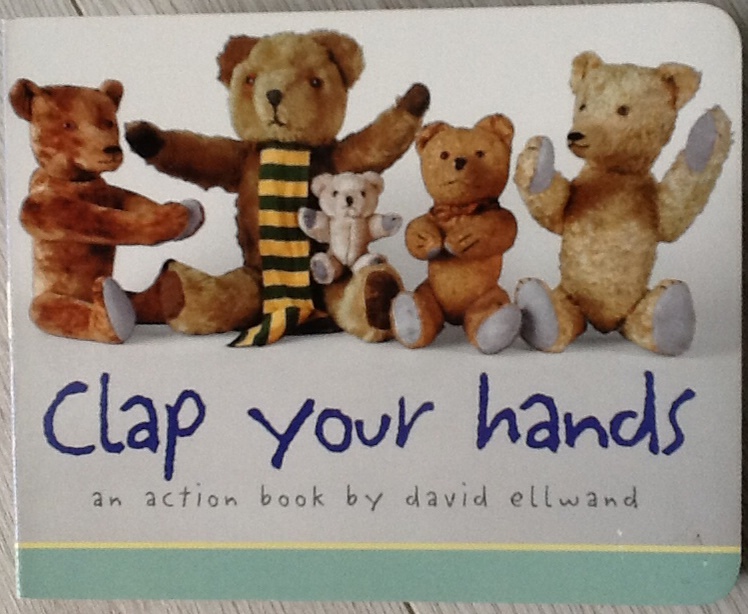 David Ellwand’s book has a very simple premise: it repeats the song ‘If you’re happy and you know it…’, with all the subsequent actions carried out by teddies. Sometimes one teddy, sometimes two, or lots of different ones. Some are new-looking, others are – as they say of second-hand clothes – ‘pre-loved’, and show it. So it should be possible to find a teddy resembling your own teddy somewhere in the line up. The teddy-bears clap their hands, stamp their feet, turn around, touch their noses, etc. etc. Some actions are more of a challenge (hop around, and jump up high) but some (flap your arms, and touch the sky) just lend themselves to being done with physical help if the child isn’t able to do it on their own. 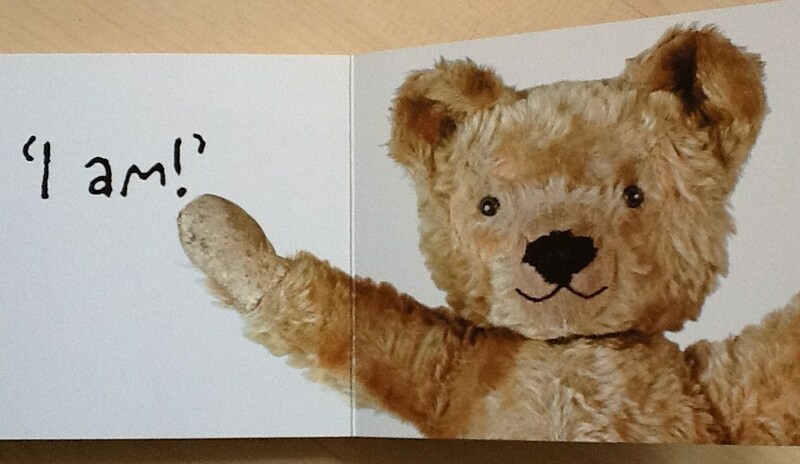 A small format board book, just 5” by 6” (12.5 x 15 cm) with clear white or pale space around the teddies. Readers of this blog will know I’m a fan of white space in baby books! It makes it much easier to pick out and concentrate on the key image, especially if a child has any difficulties seeing or comprehending pictures. The perfect language recap page. 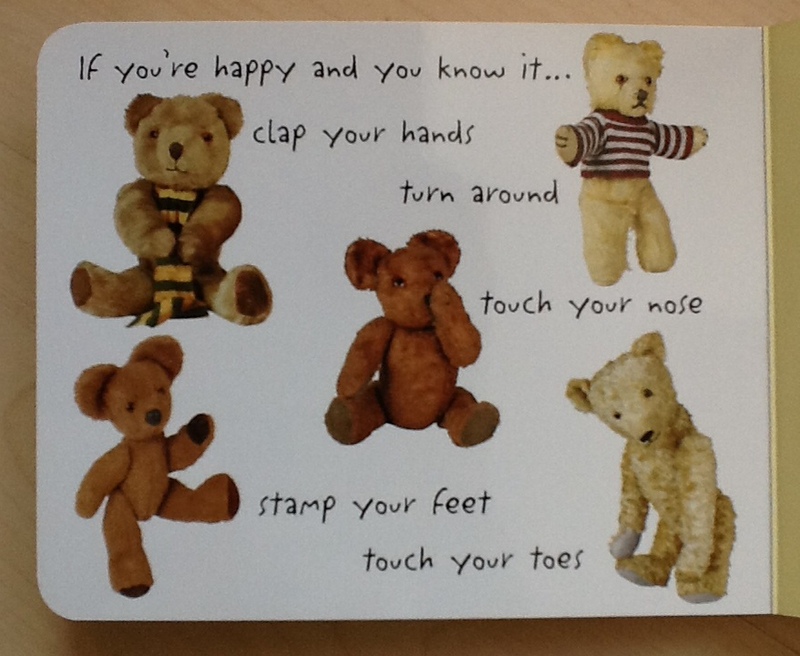 As for language development, every double-page spread repeats the ‘Happy and you know it’ rhyme with just one new action, and the last one gives a clear recap of all the actions with a teddy doing each one. This is perfect for practising what has come earlier. For many years I worked with a very inspiring specialist speech therapist, and this was the kind of book she was always on the look-out for: with a last page which revisits the key vocabulary of the book. Sadly it doesn’t crop up that often. Publishers, please note! 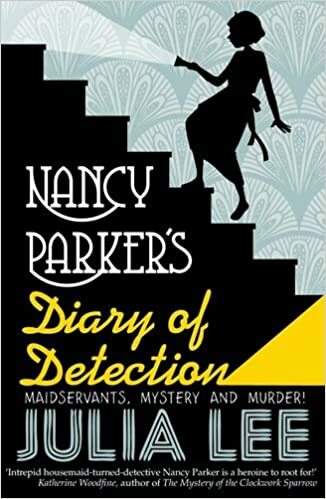 This little book and its companion, the counting book Ten In The Bed, was reprinted in 2013 by Baker & Taylor (UK) Ltd and is ridiculously cheap – £2.99.